Focusing on the economic, developmental, political and cultural issues of its member states, this book offers a critical assessment of the ASEM process since its inception in 1996, which now brings together all 27 EU members, the European Commission, and 16 East Asian states. 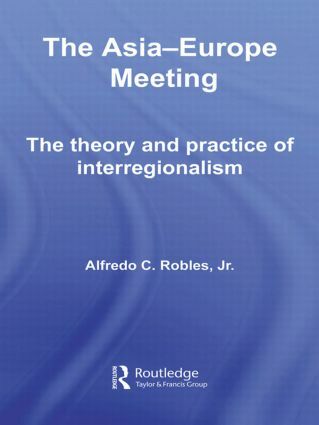 The underlying theme of the book is that the Asia-Europe Meeting should be analyzed as an instance of international dialogue – in this case, dialogue between two groups of states from two different regions - rather than as a manifestation of two regions acting jointly to perform specific functions at an 'interregional' level. The conclusion is that with the exception of the discussion on the fight against international terrorism and the cultural dialogue, the Asia-Europe dialogue rarely meets the ideal conditions for international dialogue. The way forward proposed by the book in the conclusion involves a new approach combining the European practices of multilevel governance, variable geometry and several speeds. Using a unique and an innovative theoretical framework synthesizing the work of Tzvetan Todorov and Jurgen Habermas, and supported by extensive empirical research, this book will be of huge interest to students and scholars of Asian and European politics, as well as comparative politics, international relations and EU-Asia relations.